One of the questions that many druids face, particularly if they are working in a group of any size, is how to plan a good ritual. A ritual that is meaningful, powerful, moving, and engaging to all participants. I’m sure anyone who has attended a druid (or most other forms of pagan gathering) remembers standing around in a giant circle watching people read from scripts. Sometimes, a scripted ritual can be a moving and meaningful experience, particularly with competent ritualists. Sometimes, however, they are not as moving or enjoyable. The traditional scripted ritual goes something like this: a small group of ritualists design and plan a Samhain ritual. They put countless hours into the planning, and then bring in others to assign roles, practice the ritual, set the stage, and so on. A larger group of participants then come to attend the ritual. They may be able to participate at small points; chanting Awens, making offerings, and so on. But largely, these roles are passive. The participants, then, are there to experience the ritual, to witness it, and to experience the energies present. Now, let’s rerwrite the above Samhain ritual. The small group of ritualists again get together prior to the event, but this time, they decide on a framework: honoring the ancestors, with three parts – honoring the ancestors of the land, honoring the ancestors of blood, honoring the ancestors of tradition, and messages from the ancestors (divination). They also establish parts for a standard opening and closing, as befits their tradition. They each take a theme. At the event, time is set aside to talk to all of the event participants about the ritual, and then to allow each participant to select a group to join. In these smaller groups, participants brainstorm ideas, develop a plan, and practice their plan. At the ritual later that day, each smaller group offers one piece of the ritual tied to one of the four themes. One group offers sprigs of cedar as a blessing and shares uses of cedar by ancestors of the land, another group speaks of several prominent ancestors in the tradition, and the other group invites each participant to speak the name of an ancestor and makes offerings. Each group and individual has their own work; nobody is left out, and everyone can make a positive and powerful contribution. No single person knows every part of the ritual, and there is joy in seeing what each group has done. Crazy? Actually, it works beautifully and I’m going to describe in more detail how to do this. My alternative to scripted rituals is what I call the CCC Ritual (community, collaborative, creative). This approach can be done in a group setting, anywhere from 4 to 40 or so active participants: that is, it is appropriate both for a grove of varying sizes or for a small druid gathering. I suspect it could work with a larger group with, but I have no experience facilitating it for a group above 40, so today I’m sticking with my experiences. There’s nothing wrong with scripted rituals; Scripts provide consistency: you know exactly what is going to occur in the ritual, who is saying and doing what, and at what points. From a ritual organization and ritual writing perspective, they are also useful for people new to the tradition, as the script offers something that can be reflected upon, or a part read from, without concern. They can be carefully planned in advance. They are necessary for certain kinds of rituals, like initiations, that are meant to always be performed in the same way. These are good reasons to use scripts: but also good reasons to move beyond them on occasion. The occasions where I think the CCC ritual approach is most warranted is when you are looking for a way to allow for more participation and ownership in a ritual, where you are looking to do something new (especially with rituals or events that are starting to fell tired and old). It’s also highly appropriate in mixed groups where people are coming from different traditions–this allows these multiple faiths to interact positively and each share. There are essentially two approaches to the CCR, and it is based on the size of the group and the experience level of a group. For a group that has experience and has been working for a while together, I suggest approach A. For a larger group or less experienced group, I suggest approach B (approach B was offered as an example in the opening). I’m going to share both approaches, then offer some real-life examples of how they can work. Approach A: Less Structured. This approach is really great for groves or other small gatherings when at least half of the participants have some ritual experience. In this case, the organizers of the ritual decide a theme in advance with several interrelated groups and then the group gets together to talk about the theme and break into smaller self selected groups. You need about 2 hours for this: 25 minutes or so for the larger group discussion, 5 minutes for the groups to form, and then 1.5 hours for the groups to do their planning and practice. Then, afterward (immediately or sometime later in the day or weekend) everyone comes together and enacts the ritual. Alternatively, you can come together with just a broad idea (e.g. land healing) but then you’ll need more time in a large group to decide the framework for proceeding. I’ve found it’s a bit more efficient to already have the broad idea and themes present, even if people are able to comment on them in advance (say, in a grove or gathering forum). Approach B: More Structured. The more structured approach would be appropriate for a larger gathering where there are a lot of unknown people. In this approach, the ritual organizers would select a theme and sub-themes. Each ritualist then, would be in charge of leading a group, preparing and presenting some options, and helping make sure that group was well prepared. The difference between approach A and B is the nature of the small planning groups: are they completely autonomous, or do they have a leader who can help the group come up with an appropriate and moving idea? The example I provided above with Samhain demonstrates this approach. Small group variant. If you have only a few people, this ritual process can still be done. If you have only a few people, ask each person to prepare something in advance for the group on a common theme, and see what everyone does. A few more items of note. First, not everyone who comes to a grove or gathering wants to participate. You should always reserve an “observers” group that holds space and that does not directly engage in any of the planning or ritual. This gives anyone who wants it an “out” to simply be present. Even within small groups, not everyone needs to participate in the ritual–the group of six may elect 1 spokesperson who does that part of the ritual. Finally, I will also note that it is helpful to give people as much information as you can in advance about the process, the themes, and the ritual. Then they can think about it, maybe bring something from home they want to contribute, and so on. The first large group ritual I experienced using this approach was at a Pan Druid Beltane celebration that took place a few years ago. One of the big projects was to help build a druid-themed shrine at the Land Celebration in Gore, VA. The Land Celebration already had many different shrines to different spiritual paths, like a Jewish Wailing wall, a Buddhist shrine, multiple labyrinths, and so on. After we built it, the final step was to ritually consecrate it. Of course, we could not have planned this ritual in advance because we didn’t even know what the nature of the shrine was going to be. So, as a group, we set forth to design our ritual, coming up with multiple groups that blessed the shrine, blessed the ancestors and divine, “listened” to the land, made offerings, and opened/closed the space. It was a beautiful ceremony, and not only allowed the druids of different traditions to share pieces of their tradition; it allowed all to contribute and empower the shrine. In a second example, over the summer, we hosted a small Land Healing celebration for about 14 druids. The overall theme was “land healing” and we wanted a healing ritual for the land not just here on the homestead where we were hosting it, but also a way for others to take that healing back with them. Almost all participants were experienced druids who had done multiple kinds of group rituals before and most who had worked together at larger OBOD gatherings over a period of years. Together, we decided on the earth, sea, and sky as our three themes. Participants self selected into the groups. Each group of 3-4 people then worked to bring the healing energy of earth, sea, and sky both inward to this land and outward to all lands. It was a beautiful ritual: we used a standard opening with assigned parts. The earth group had us write on and bury stones, sending the energy out to the land. The water group had different waters from around the world, and each person was also asked to bring water to the gathering from their home. We ceremoniously combined the waters, blessed them, and then each participant later got a small vial of water to take home. The air group focused on bringing healing energy through song (common to wassailing and other traditions), movement, and music. As the ritual unfolded, everyone was able to experience two new things from the two other groups; we closed the ritual with group divination. The elements: four groups of air, fire, water, and earth. The CCC ritual creation is a very different kind of ritual, with a very different kind of result. I would highly encourage you to experiment with it if you are interested! If you’ve done anything like this, please share in the comments! Also, if you are planning it, feel free to share! A glorious oak tree in fall colors! There is nothing quite as majestic as an oak, which is likely why ancient druids met in groves of them to perform their ceremonies. As I write this, I look at my glorious black oaks, white oaks, and burr oaks in the surrounding landscape and their incredible mantle of gold, tan, crimson and oranges. Where I live, the oaks keep the green on their leaves through most of the fall season, and begin their transition into color just before Samhain. The oaks and beeches, here, are the very last to lose their leaves–if they lose them at all. Many of the oaks, especially the younger ones, keep their leaves all winter, dry and crackling, and only drop them before they bud out again in the spring. Their behavior in the fall and winter months is certainly a testament to their energy and strength. All across the land, the oaks’ powerful presence here at this time of no time, holding space for all of us as we move further into the dark half of the year. This is a post in my “sacred trees in the Americas” series where I explore sacred trees in the context of North America, particularly the upper Midwest and East coast. Often, the meaning of trees and the place of these sacred trees in the ecosystem differs from traditional European sources, and so I’m working through a number of dominant trees here with extensive research, exploring their physical uses, meanings, magic, sacred traditions, and more. Previous trees in this series have included: Elder, Walnut, Eastern White Cedar, Hemlock, Sugar Maple, Hawthorn, Hickory, Beech, Ash, and White Pine. Today, we will be exploring the majestic oak, a dominant tree in much of North America. In North America alone, over 56 species of Oaks make their home. Where I live, we have about 20 different species of oak, although certainly, a few oak species dominate: chestnut oak, white oak, northern red oak, swamp oak, and black oak. In other parts of the US and Canada, different oaks may be present or dominant. The good news is pretty much wherever you go that is not a desert here, you can find oaks! And this is great news for druids, as the oak has been a primary symbol of druidry since the time of the ancients. One dominant, majestic oak in the eastern seaboard is the White Oak (quercus alba); white oak is the most dominant species in North America. White oaks can grow up to 100 feet high, with a 5 foot diameter trunk. One of the few places you see such large oaks are in old growth forests, such as Cooks Forest in Western PA. Black oaks (quercus veluntina) are much smaller trees, getting up to 80 feet high with a smaller 3′ trunk. All oaks have a very strong, hard wood with a close grain. Oak in past times was used for any situation where strength and durability were required: old barns, oak barrels, railroad ties, posts, ships, hardwood floors, and furniture, to name a few. Like most other hardwood nut trees (hickory, walnut, butternut), oaks are relatively slow growing and long lived. Some white oaks can live 600 years or more. Oaks are considered a “climax” species, meaning that once mature oaks are present, the forest is considered mature and no additional ecological succession will take place. Oaks are a keystone species in many forests on the East coast and in the Appalachian mountains: the oaks provide understory, food, and habitat for many other species and drive the overall shape of the forest. A typical mixed oak forest may also include hickory, white ash, tulip poplar, beech, sugar maple, or black cherry with an understory of serviceberry, spicebush, or witch hazel. This is contrast to the other typical forest type, which here, would be the birch/beech/hemlock forest with an understory of witch hazel. Of course, I am writing here of the typical types of forests found in the Allegheny mountains; your own observations of your local ecosystem will also be helpful to determine how oak functions where you live. Honey mushrooms (known around here as “pa-pinkies”) can be found on the roots of oaks infected with them. The infection that produces the honey mushrooms is armirillia root rot; it can be characterized by, as writes in Field and Forest, “blackish, fibrous, rootish strands extending up the tree beneath the bark.” Unfortunately, honey mushrooms, while delicious, kill oak trees. The cycle of life can be a fierce one; I’ve seen honey mushrooms take out ancient oaks, turning them into soil once again, and have watched young acorns sprout in the remains of their ancestors. Most oaks, like other hardwoods, have to be between 30-40 to produce acorns and up to 60 years to produce a full crop of nuts. Oaks flower in the spring; depending on the frosts that year, the frost may impact their nut harvest. According to Samuel Thayer in Nature’s Garden, oaks produce a strong acorn crop every 2-3 years. This is an ecological adaptation to prevent the populations of squirrels and other rodents that eat acorns to eat the entire crop each year. Smaller crops for two years keep populations small, and a large crop in a 3rd year will ensure the survival and continuance of the oak. Further, smaller crops train animals to “hoard” the nuts, stowing them in the ground and forgetting them, so that more oaks are born. All acorns are edible, but in order to eat them, they have to be properly prepared. Different oaks have smaller or larger nuts–around here, my favorite for eating is the chestnut oak or the white oak, both of which produce very large nuts. These nuts are also both delicious when roasted. Acorns, like all other parts of the oak, contain tannic acid, which makes the acorn bitter without preparation. Leeching the tannic acid out of the acorns (through water extraction or boiling) turns acorns into incredibly delicious nuts and flour. For extensive instructions on how to harvest, leech, and prepare acorns, I suggest Samuel Thayer’s Nature’s Garden. Another good resource is the book Acorn and EatEm by Suellen Ocean. Euell Gibbons has several great recipes for Acorns in Stalking the Wild Asparagus, including candied acorns, acorn grits, acorn meal, and acorn bread and cakes. The Native Americans used acorns as a key food source, making acorn meal and creating a flatbread that was eaten by many tribes (acorn was so important to so many tribes, they were called “acorn eating” tribes). Native Americans also used the inner bark (containing tannins up to 11%) which could be used as an astringent for many internal purposes. Thayer suggests that because of the history of exploitation and conquering in North America, part of the reason that acorns are widely thought to be poisonous was due to European-Americans disdain for Native American peoples. Returning, then, to the acorn as a food source can help us not only connect with the oak, but also deeply honor the ancestors of the land. As druids know, the term “druid” is commonly translated “oak knowledge”, “oak-knower” or “oak-seer” referring to the fact that druids had knowledge of the oaks (and as oaks are a pinnacle species, therefore, druids had knowledge of the broader landscape) or perhaps, understood oaks on the inner and outer planes. In the druid tradition, oak is tied to that same ancient symbol of the druid possessing strength, knowledge, and wisdom. Through taking on the term druid, we bring the power and strength of the oak int our lives and tradition. We don’t have a lot of surviving information about the Ancient Druids and their rituals, but one of the most famous was described by Pliny the Elder describes the druids as “magicians” who “hold nothing more sacred than mistletoe and a tree on which it is growing, provided it is a hard-timbered oak….mistletoe is rare and when found it is gathered with great ceremony, and particularly on the sixth day of the moon.” The ritual is that two white bulls are brought, a white-clad priest climbs the oak tree and cuts the mistletoe with a golden sickle, and then they sacrifice the bulls and pray. This mistletoe, growing on the oak, was said to be the most powerful medicine, curing all poisons and allowing an infertile animal to reproduce. Pliny notes that druids performed all of their rites in sacred oak groves; when the druids were destroyed, the Romans cut all of their sacred oak groves down. You can imagine what those ancient groves must have been like when you encounter even a single ancient oak tree–majesty and presence. In the American Hoodoo tradition, Cat Yronwode describes in Hoodoo Herb and Root Magic that Oak (especially Quercus Alba) can be brewed into a tea and then added to a bath to remove jinxes; usually, a rootworker will also rub the client vigorously downward and pray as part of this removal. She also notes that oak and mistletoe are burned together to smoke jinxed people or to remove unsettled spirits or ghosts from a house/place of business (I wonder if this oak and mistletoe combination ties back to the ancient druids? Most certainly!). She also notes that oak galls increase the power of any herbal blend for any magical purpose; it can be carried or brewed into a tea for bathing to increase the potency of other workings. Culpepper’s Herbal notes that the oak is governed by jupiter and that the oak is known to to help resist poison of both “venomous creatures” and those of herbs and plants. Finally, in alchemical circles, an article by Jean Dubuis titled The Preparation of a Powerful Spagyric Elixir without a Laboratory also offers some additional insight on the oak (here’s a link to one version). Dubuis essentially made a vitalizing spagyric tincture of acorn (for those not familiar with spagyrics, spagyrics are plant alchemy and allow you to make powerful, energetic plant medicine made in line with the alignment of the planets using specific techniques.) This oak elixir is vitalizing, carrying the energies of life. Primarily, oak is used as an astringent to help tone and firm up lax or leaky tissue. Of the astringents available in North America, it is one of the most potent. I was taught by herbalist Jim McDonald to harvest the inner bark of oaks for this purpose, specifically, the oak’s cambium. This, we dried and made into a tea/toner or into a tincture for internal use. Matthew Wood in his Earthwise Herbal (Old World Plants) likewise shares that oaks’ astringency is present in any oak tree. He mentions specifically the usefulness of oak for gum disease/loose gums, varicose veins, and other such lax/goopy conditions in the body. He also notes that oak can be used mentally just like it is physically. He writes that Oak, when used as a flower essence, “is the great remedy when the integrity of mind or body has been broken down by long, arduous suffering or usage….persons who struggle against adversity; never give up but never succeed; [oak] helps a person choose the battles they can win” (294-5). I have already written of the critical importance of oak as a sustaining food for many of the tribes of North America, spanning the whole way from the east to the west coast. In “American Indian Fairy Tales” Margaret Compton tells a story where the prince of the hares, a trickster, has his feet burned by the sun and then decides to go on a journey. Finally, he comes to the edge of the world where a cliff of trees stands tall. He asks the trees what they are good for, and ash, birch, and oak responds. Oak tells him, “I shelter the great warriors. I mark the spot for their councils. From my boughs are made the swift arrow that bring food to the feet of the hunter and carry the death to his enemies. In an article with a modern Native American elder of both O’odham and Chicano heritage, Dennis Martinez. In the article Martinez shared a number of features of oaks in the US west coast. He noted that both red oak and white oak were considered so important to the native peoples of California that they considered the oak the “tree of life” because of its benefits both as food and medicine. There were many acorn-eating cultures in California up even until the 19th century in the US. In one of my favorite Senaca legends, the mighty oak stands along with the tribe of the conifers (white pine, hemlock, and the others) to hold his leaves and to wear down the winter and bring spring in again. Not only does this show the strength of the oak during the winter months (when many other deciduous trees are sleeping) but it also shows the connection of the oak to longevity and power. A Sioux legend, The Man and the Oak, tells a story of a young woman who is taken in by a chief’s family. She falls in love with the chief’s son, but since she is now a member of the family, it is not permissible. The young woman sneaks into the son’s tent for several nights, and in attempting to see her face by stoking a fire, accidentally burns her. He is so distraught that he goes under an oak tree and stays there all day and into the night. A small oak tree grows up through him and pins him and he cannot move. The young woman disappeared, and the oak tree is found to be a curse. A thunder god appears and frees the man of his curse, crumbling the oak tree. Strength: The oak is obviously a sign of strength, both the strength of its branches and wood, and its strengthening qualities as a medicine and magical tree. All cultures have revered the oak and sought such strengthening qualities, and that strength can be seen throughout the lore. Wisdom/Knowledge: Tied to the ancient term for “druid” as “oak knowledge” oak has long been associated with knowledge and wisdom. We can see this also in the Native American lore, where oak “makes space for councils”. Thunder/Weather: As we can see from both the IndoEuropean traditions as well as certain native american lore, oak is also tied to weather/thunder and thunder deities. I hope you’ve enjoyed this brief foray into the majestic oak tree–and if you haven’t yet had a chance to visit an oak as it dons its incredible fall mantle of colors, perhaps this is the week to do so! Dear readers, I would also love to hear from you any stories you want to share about the incredible oak tree. I had the most amazing thing happen to me about a month ago, and it involved the direct (palliative) healing of an active strip mine site. I was heading to teach an herbalism course at a friend’s business about 15 minutes away from where I live. My drive this requires me to cross a divided highway and do a u-turn at a site that is a very new active strip mine. They aren’t fully removing the mountain, but they are certainly cutting into it quite a bit, and ripping up the entire surface of the land in the process. For a while, I’ve been driving past this spot, and energetically, it just feels bad, like in the pit of your belly bad. I knew something was to be done, but I wasn’t sure what. So I kept visiting, listening, and being told “wait” (using the same strategies I’ve shared with you earlier in this series). And so, wait I did. That particular day when I was going to teach my class, we had both sunshine and storms. Rain would pour for five minutes and then it would be sunny again. These are such fun days to enjoy, and usually rainbows abound. I hadn’t yet seen one, but I had anticipated it, and sure enough, I wasn’t disappointed. Just I was turning around, I saw a rainbow–it was right in front of me, on the road ahead. I decided to follow it slowly with my car, and suddenly, it jumped. When it jumped, I looked to my left, and there it was, coming down right in the center of the whole strip mine operation. Now, for anyone who has studied the old Celtic, underworld, and fairy lore, a jumping rainbow is described as an old trick to lead you somewhere–and that’s definitely what happened in this case. Now, every day, as part of my AODA practice, I connect with the three currents (a strategy I’d suggest in preparation for this kind of work; I’ll talk more about this later in this post). I’m pretty adept, at this point, in channeling down the solar current. 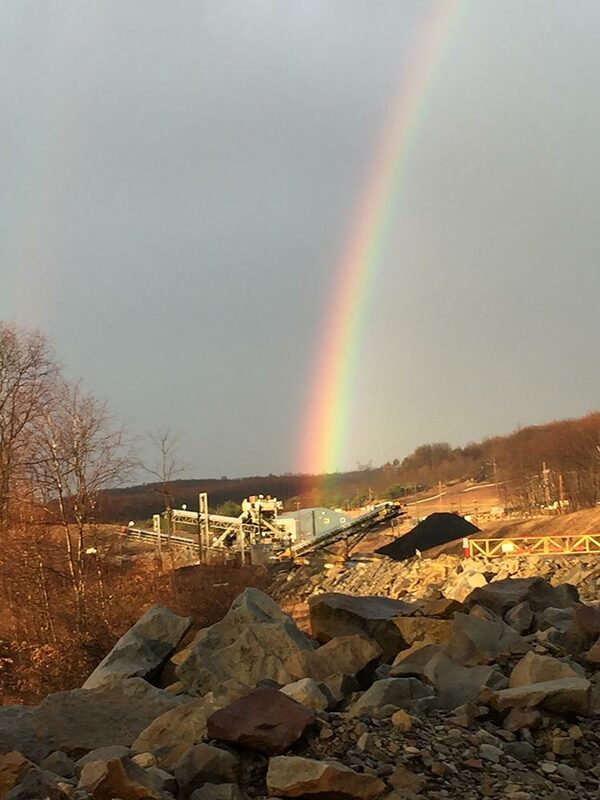 I connected with that rainbow, with the sun’s rays reflecting off of those droplets of water and pulled it down, deep down, into the darkness and suffering of that strip mine. I sat for quite a while and channeled down that energy, and as I did, the rainbow grew brighter, and more brilliant. At some point, the work felt done. The land felt cleaner. More at peace with what was happening. The worst of the bad energy was gone. Each time since I’ve visited that spot, the effects of the rainbow remain. Now, obviously, a rainbow working is not really something you can plan! But, I did want to share this as a potent land healing strategy to open up today’s post. And I think what I can share is that even if you don’t have the blessing of a rainbow over the spot you want to help heal, you do have the energy of the sun frequently, and it can be used in various ways–as we’ll explore today, along with other strategies for palliative care. When I started this land healing series, I started with descriptions of the different kinds of healing work you can do: physical and energetic land healing for sites that need active regeneration and healing (which is where things like permaculture fit) and palliative care (for sites that cannot yet be healed and are underging active harm). Today’s post is going to explore specific land healing strategies for palliative care that you can engage in–these are specific strategies for sites that are just like the rainbow working above: these sites have ongoing active destruction or are far from what nature intended. As before, if you haven’t read the earlier parts in this series, I would strongly suggest that you do so, as the series builds from the previous posts: Part I, Part II, Part III, Part IV, Part V, Part VI and Part VII. I think that Palliative Care for sites that are currently experiencing destruction and suffering is just as hard to deal with as the impending destruction of a natural site (which I talked about two weeks ago); both of these give you a sense of powerlessness that is difficult to deal with. You want to look away. You want to disengage. But instead, I suggest you try to engage, to help, to heal. Because I can tell you this–nobody else is doing this work on our landscapes. If we, as druids and those who love the land and hold her sacred can’t do it, then who can? Even when looking at that strip mine, that logged landscape, that fracking well, that acidic river (the ones I deal with here most often), know that that what I am looking at is still the living earth and it is still sacred land. This kind of stuff is not one a druid meandering through the woods wants to find, but it is unfortunately a common reality that we face in the age of 21st century industrialism. I believe that every age has its own spiritual challenges, and that our spiritual practices are often born from what we experience; I certainly see responding to this kind of experience as necessary for a druid living in such times. And to me, we are in a unique position to do something, and I believe, even for sites that are actively being destroyed and harmed, that something can have very long-term implications. Consider palliative care like the first stage in the healing process–you are setting the stage for what is to come. I want to start by saying that nearly all of the strategies I outlined two weeks ago for sites that are going to be destroyed also work for palliative care. These include: working with the stones, working with Indian Ghost Pipe as a plant ally, putting the land in hibernation, and saving seeds. These are strategies that can do tremendous good for sites that are undergoing active harm. At the same time, there is a large energetic difference between these two kinds of sites: namely, a site that is not yet destroyed doesn’t have this energetic darkness and active suffering that a site that is destroyed carries. Its that energetic darkness that is the focus of some of my work in palliative care, and so, I generally find myself doing a lot more energetic cleansing work on actively destroyed sites, and hence, that’s what today’s post will mainly focus on. I’d also like to share that the energetic nature of active destruction changes over time, and I think, is due in part to where in the process things are occurring. If a site has been actively destroyed for a long period of time, you often encounter this energetic deadness or a complete lack of vitality. A lot of the rivers around here are like that–they have been acidic and poisonous to life for half a century or more–this means that they are largely “dead” feeling, where the active strip mine site (a new operation less than a year old) is energetically very dark and intense. Most sites actively under siege, instead, have this really dark intensity to them and feel really “wrong” and “awful” just being near them. For example, when I was visiting a friend in West Virginia not too long ago, I was driving and was struck with this horribly awful feeling as I rounded the bend. Turned out, just around the next bend was a huge gravel/sand pit, cutting into the mountainside–and that was the source of the suffering. This is exactly the kind of site that could benefit from palliative care. And so, my real focus today, is on active suffering and sites that have that energetic darkness, sickness, feeling of absolute wrongness, that pervades them. So about 5 posts ago in this series, I shared information on the three currents and how ancient peoples, and modern ones, can use the currents to help heal and bless the land. In the case of palliative care, nearly all of the problems we have are with the currents of energy in the earth, the telluric currents. The telluric currents govern what is on the land and of the land, what is on and of the earth, and that’s where the bulk of the problems for industrialized cultures, great and small, arise. It is the uncontrolled fossil fuel use, an earthly treasure, that has our world’s climate in chaos; it is the pillaging of earthly resources that are really causing so many palliative situations to occur. These telluric currents become easily corrupted by the many earthly activities that pervade industrialized society: gravel pits, strip mines, regular mining operations, pesticides and industrialized farming, fracking, tar sands, logging, typical lawn care, and more. And so, I have found that attending to the telluric currents, by way of ancient knowledge, can tremendously help in palliative care. I have found that you can effectively use the solar currents to clear away, or purify, the worst of the energetic darkness of sites under active destruction. There are lots of ways to do this, and one of them was how I opened this post: a rainbow working! There are many, many ways to channel the solar currents down into the telluric, and this is an excellent way to get rid of the energetic crud, the worst of the suffering, and provide some respite. I kind of see this work like providing a healing balm to soothe the energetic effects of active destruction. You aren’t solving the problem by any means, but you are certainly doing something that really helps. Most of my strategies for channeling the solar (sun) down into the telluric currents (the energy of the earth) for purification and blessing involve using specific rituals within the AODA framework. These include the AODA’s sphere of protection (which I use most often), our seasonal grove rituals (found in the Druid Grove Handbook) or the communion ceremony from the Gnostic Celtic Church (found in the Gnostic Celtic Church Handbook). Each of these rituals establish the space and then, as the core work of the ritual, connect to the energy of the sun, the earth, and awaken the telluric current. I’ll share one simple derivations here, but I wanted you to understand where a lot of what I do comes from and where you can get more extended versions. I’ve been working in this tradition for over a decade, and I think, in its own way, maybe it led me to this work by putting the perfect tools in my hands! Grounding and centering myself for the work at hand. Part of this is opening myself up for the flow of energies, breathing deeply, and feeling rooted in the living earth. As part of the grounding and centering, I would open up some kind of protective space (even if its as simple as drawing a circle on the ground, or in the air as white light). I would next go to the east, and call in the positive qualities of the east to aid the land and me in the working. Then I would banish in the east, driving away any harmful or disturbing energies. I’d then go to the south, west, and north, doing the same thing: calling upon the positive qualities of the element and banishing the negative ones. As you get used to doing this, you’ll find you can banish the negative qualities in larger and larger regions and areas–and this is super helpful for clearing work. At each of the quarters, I would use my senses to experience that element in the world around me, identifying the influence of those four elements on the landscape: in the east I might look at the movement of the air, pay attention to the smell of the air, the birds in the sky, seeds blowing in the wind, and so on. Then, I would invoke the three currents: I would first draw a circle on the ground and invoke the telluric current, envisioning it rising through the circle as a greenish-gold light. I would assess its purity and flow. Then I would trace a circle in the air and pull down the solar current, envisioning it as a yellow flame coming down from the sun and the celestial heavens. I would intone the “Awen” and then draw upon everything I had called: the four elements and the currents to unify the currents, awakening the lunar current and sending the solar deep within the telluric. I would envision energy coming from each of the four directions, from the sky, and down, into the telluric. I would envision this work as long as necessary, sometimes for several minutes, sometimes for a half hour or more. Usually it doesn’t take too long, but it depends on the area. When I felt the work was done, I would close the space (but would not send away what I had called). That’s it in a nutshell–there’s more to it than that, but I think that’s enough for you to work with, and adapt, as you see fit. I would say that there are more elaborate rituals and workings using these energies, but doing something basic, to start, is a good way to begin. Some of you, who are new to ritual work, might say, “yes, but does it work?” The truth is, I cannot believe the potency and usefulness of the Sphere of Protection alone in much of this work. I find its an extremely versatile for a lot of different kinds of land healing (and other healing) work. As I wrote about in my third post of the series (which helps set up today’s post) as well as my recent post on sacred gardening, humans have long been using standing stones, temples, trees, ceremonies, and more to channel the solar energies into the land for healing and abundance–but I have found these work fantastically for palliative care. The reason is simple–setting a standing stone or using some other key marker to help channel down the solar current is a working that takes time and space to achieve. Unlike a ritual, which radically alter a space and its energetic profile quite quickly, a standing stone is slow work, over time, over potentially a lot of time. This lends itself well to palliative care, because its like a slow-releasing healing agent. I’m having difficulty putting into words exactly what I mean here, but I hope you get my meaning. Hermes is setting the standing stone in the pool! 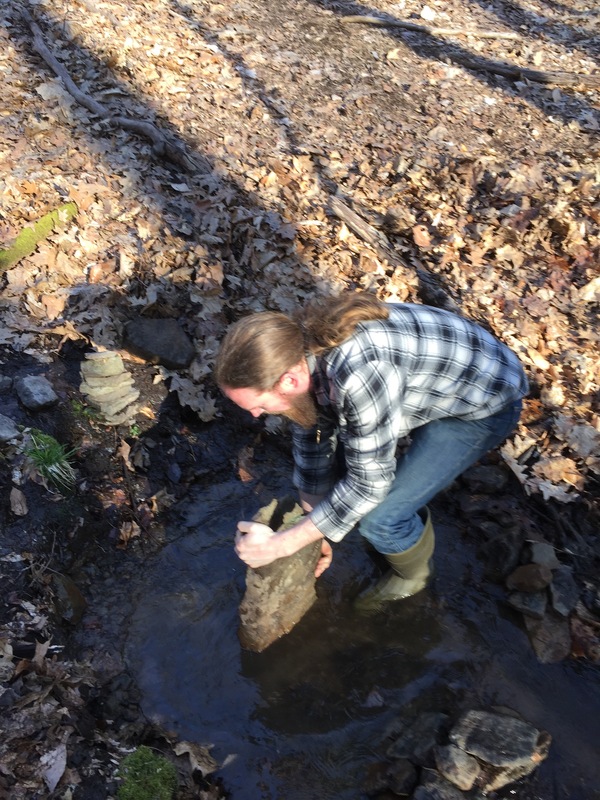 So just this past week, two druids snuck into the woods into the park north of town and worked to set a standing stone in the forest; the same forest where many gas wells are present. We did this because here is a place, in the heart of fracking country, where the waters and forests and lands are under active duress. We had come across a natural spring earlier in the week on a hike, a tiny spring that pops up only in the springtime of the year or after heavy rains. It was barely noticeable, but eventually flowed into a small stream with moss-covered stones. We carefully cleared away the leaves and sticks to see what we could find, and were excited with the discovery of three trickles of water welling up from the earth, almost in the shape of an awen. The next day, we came back better prepared and set some rocks below the spring to created a small gazing pool. Then we went off in search of a standing stone–and sure enough, within about 10 minutes, we were delighted to find a perfect standing stone for the pool. We set that stone as a long-term healing presence, to bless these waters, those that flow past so many of those gas wells, and later, one fracking well. To help bless all these waters that are under duress from the many fracking activities here, to cleanse and nurture the telluric currents, the spirits of these lands, and the physical forest during this difficult time. The interesting thing about this particular spot is that its right along a fairly well-used path, so if passerby are looking in the right direction at the right time, the pool and standing stone will be quite evident! Now, we didn’t do any ritual work at the spot–we just wanted to set the stone and let it do its good work for a while. However, we could come back at a later point, when we felt it was time, and do that work. Even if you can’t set a standing stone, I have found that a small shrine, carefully placed and tended, can work wonders over a period of time. 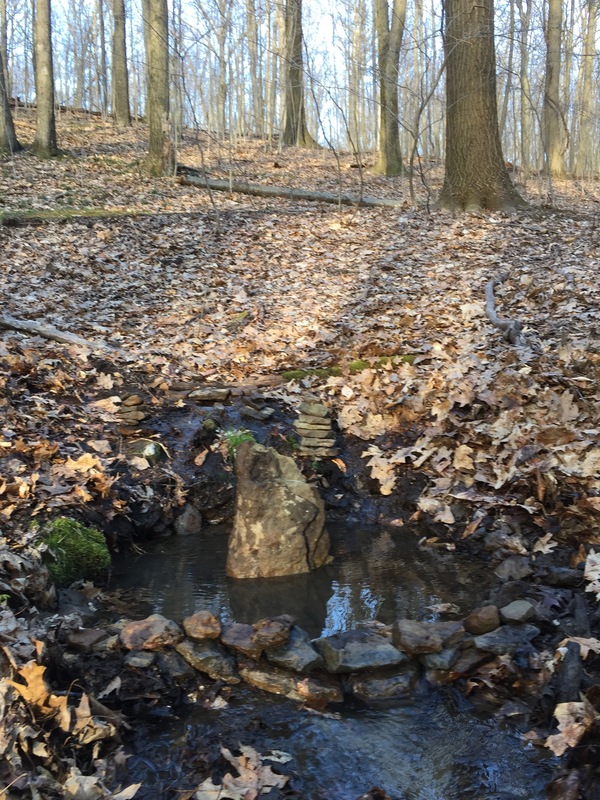 Perhaps you create a simple stone cairn and pour blessed waters (see below) over it every season. Perhaps you plant a rare native plant and surround it with stones. The actual shrine, and what goes into it, can be intuitive. But these small places are healing, they are like a light in the dark. For land that is suffering, what your shrine does is give it a focal point, something to hang onto, something to direct its attention and let the spirits of that land know that someone is thinking about them, wishing them well, and saying that we are here in support. I have made many such shrines over the years–small places, hidden places, that I quietly go and visit. You will get a sense, from the land itself, about how often you need to come and what you can do while you are there. I’ve mentioned before on this blog about the wonderful (and often subversive) nature of music and singing for any land healing work. This is healing work, of any variety, that can be done publicly and openly. I have found that certain songs, especially old folk songs, work particularly well for soothing the land, and allowing it to prepare for what is to come, and putting it to sleep. If you use this technique, you will develop your own songs that that have meaning and may even be given songs to use with the land–but I would start with the melodies of old folk songs, songs that have been sung in your lands for several generations at least–and use those. I found a book once, at a local cave that was open to the public, called “Back Porch Melodies” and it had almost 50 folk songs–many of these I found useful and adapted them to my practices. 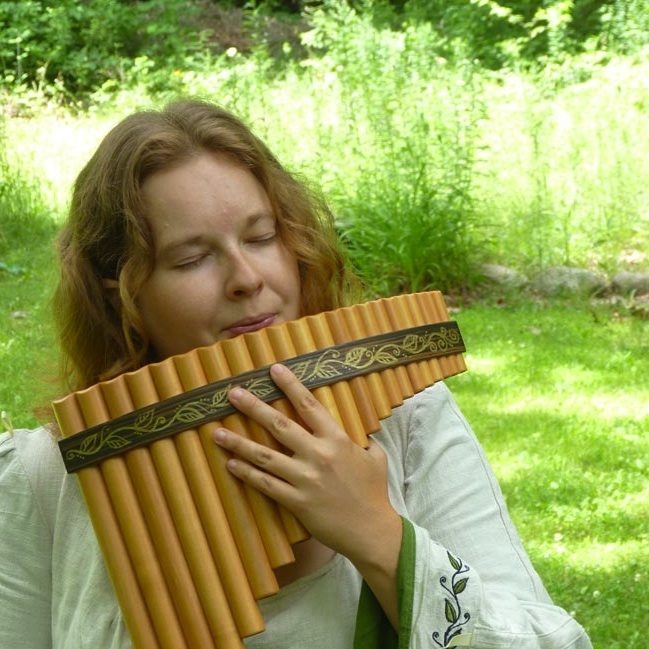 I may change the lyrics or play them on my panflute, but the songs resonate deeply and the music can soothe and help pave the way. Another thing that I have done over a period of time is to collect and bless sacred waters (see this post for a ritual to create them). I usually do this work at Imbolc or the Spring equinox each year–when the waters are flowing and the spring is returning. I began working with blessed waters many years ago,as part of my work with water over a period of years. Now, I have this sacred water, used for countless ceremonies over the years, and from countless places all over the world, that I use as part of my land healing work. Because the rivers, the lakes, and the oceans are one of the things tremendously under distress, a little bit of healing water goes a long way. I have placed a few drops of my water into the headwaters of various rivers, so that as they go and become more polluted, the healing waters are still there, flowing. I also place them into the polluted rivers themselves, dropping a single drop or two in with prayers (think homeopathic doses, here!). I use the sacred waters to drip on the roots of trees and plants, to lathe stones, to pour over healing altars and standing stones, and much more. I have found that carrying a little bit of this water with me anywhere I am means that I am always ready and able to do some healing work. And I can give it away to others, and then they can do good work as well! I replenish the sacred waters, adding to them, by visiting springs and other local healing wells. These have an abundance of good telluric energy and you can multiply the sacred waters you create as much as you need to. This last strategy I’m going to share today for palliative care is one that I’ve used only once, but I think its an important one, and some of you may find yourself also as needing to do this work. When I first moved to MI, there was this big shopping mall area–it had a stadium, all these highways, buildings, even a big giant garbage mountain that they were doing as a dump. But the area just felt sacred to me, in ways it normally wouldn’t have. Every time I was there (I had to drive past it on my way to campus each day), I would see the most amazing things: spirals of birds, the light of the sun peeking through the clouds, interesting cloud formations, etc. It was just slightly more magical, more sacred, than everywhere else around it. So one day, I went to the site, climbed up on a big hill near a big box home improvement store, and lay among the weeds, listening with my inner and outer senses, and observing. I saw a vision of the site, what it had been (indeed, a sacred place for peoples before), and how much it was suffering now–it was very much awake and alive, and being used in a very unsacred manner. I was asked, very clearly, to gather up a small handful of soil from the site for a year period–at each of the solstices and equinoxes. I did this and then, had the bowl of soil at my house for some time on one of my altars. Finally, I was led to move the soil to a very sacred place, an old growth forest. When I next drove by the shopping mall area, it wasn’t sacred any longer. I had somehow…transferred…what was sacred there to a place it could reside. This was certainly a kind of palliative care, but in this case, it was literally transferring something sacred to somewhere else. I hope that this set of strategies proves useful to you in your ongoing land healing work–and please comment and share your own strategies, thoughts, and experiences. I’m especially interested in hearing from you about my last two weeks of posts–and the many specific strategies that I’m sharing. I believe I have 1-2 more posts to write to complete this series, at least at this time. Blessings to all!